The battle for President Trump's tax returns has officially begun. 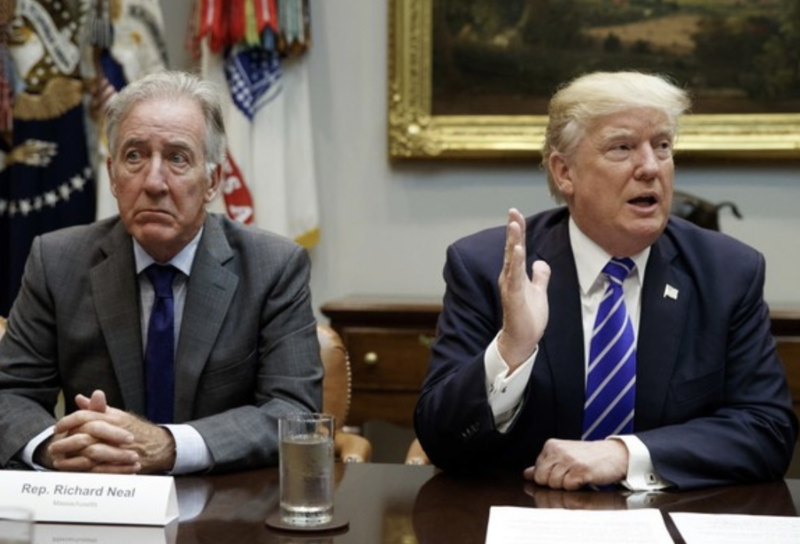 NBC News reports that Ways and Means Committee Chairman Richard Neal said Wednesday evening that he had filed a formal request with the Treasury to obtain six years' worth of the president's tax returns, initiating what is expected to be a protracted legal battle over Congress's efforts to take possession of the documents as they investigate Trump's business and personal finances. Treasury Secretary Steve Mnuchin said during a Ways and Means hearing last month that he would intervene to protect Trump's privacy if Congress tried to request the returns. Since he was a candidate, Trump has maintained that he can't release his returns because he was being audited by the IRS. Still, some of his '95 filing leaked to the NYT late in the campaign, and revealed that by claiming a massive paper loss, Trump might have avoided paying federal taxes for up to two decades. Only three Congressional committees have the authority to request Trump's tax returns: Ways and Means, the Senate Finance Committee and the Joint Committee on Taxation. And it was reported last month that Neal had asked the committee's lawyers to prepare the documents to request Trump's return. If Treasury denies the request, House Dems will need to decide whether to contest that decision and wage a legal battle to have them overturned. Even if they do receive them, the Committee would be required by law to protect them. Of course, the odds that they would leak almost immediately - as every reporter in Washington would be racing to obtain them - would be very, very high.